Fasting for a single day in a week is increasingly becoming a popular method to keep your health in check. Not only fasting helps you lose some weight, and give your digestive tract some rest, but it also help you clear your mind and feel revitalized. We have Sundays to rest, or complete the tasks which were impossible to finish otherwise on a working day. But, have you ever thought that our digestive system is hardly ever on vacations. In fact, the more vacations you have the more it gets busy. Now, if you don’t eat for a day and just spend the day on water, your digestive system can find that rest. It’s not just the digestive system but remaining of the organs gets their share of rest too, giving them ample time to heal. You should consult your physician before planning on a fasting regime. It may not be suitable for all people, e.g. avoid if you’re a diabetic on medications, if you’ve nutrition related issues, during pregnancy, or you’re down with an illness. If you’re not careful while fasting, you may end up with several problems, short term or long term. Hence, it is recommended to be prepared for the fast beforehand (and consult a physician). First of all, choose a day that is less hectic for you, preferably, a vacation day when you have no plans of travel. Avoid any work requiring excessive efforts. Activities like watching TV, reading, light yoga exercises, or working on your laptop do not require much efforts, so it’s ok to include them. On the fasting day, you must drink only water. Neither you should take any form of solid food, nor should you take any liquid other than water. One should drink a minimum of 1.5 liter while there is no upper limit to the intake. If you’re a beginner the uncalled lack of food may make you uncomfortable. You might feel dizzy, weak, or nauseated. Some might even experience headaches or fall in blood pressure. However, that shouldn’t bother you. Go back to the bed and rest for a while (if symptoms are severe consult your physician). When you get accustomed to fasting you might not experience any symptoms at all. It’s important to break the fast with caution. You must not directly overload your stomach with food. Since the digestive system would have been on hold for the whole day, it wouldn’t be ready for sudden burden. Start with juices, especially orange juice or lime juice. Fruits can also be taken to break the fast. However, do not add spices or anything heavy on digestion. A normal meal can be resumed from the second meal. First of all, as I already mentioned, it gives your digestive system a rest. If the system requires healing or recovering, the fast should give it the opportunity. It improves the bowel functions too, thus enhancing the overall metabolism. Fasting would help you improve your hunger response too. Feeling hungry is the result of certain hormones and indicators release. Now, when one tends to eat more, a common case with obese people, the ability to feel full is delayed. 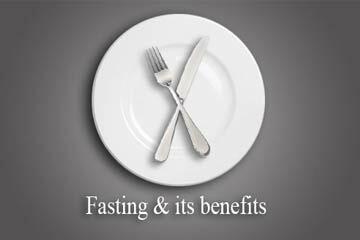 However, fasting helps the body normalize the response, thus improving your hunger, i.e. you tend to feel less hungry, as a result eating less. You feel refreshed and energized. You achieve a mental clarity and, thus, are more at peace. The time your body receives through fasting also helps clear a lot of toxins from the body. Fasting helps in losing some of that extra fat. Fasting intermittently forces your body to utilize body fats in place of sugar. Fasting is even used by many athletes to keep their body fat proportions in check. Fasting strengthens your immunity. It reduces damage by the free radicals, and controls inflammatory conditions in body. Now, if you knew anything about the cancer tissues, they are the ones with voracious appetite. Hence, fasting starves them off. Fasting also has some anti-aging effect. Since, the body performs lesser metabolism hence lesser accumulation of byproducts that facilitates aging. Studies have shown that the lesser one eats more the life span is owing to lesser metabolic activities. Fasting improves insulin sensitivity. Thus, regularly observing fasts would allow your body to tolerate sugar in a better manner. Fasting also clears your skin and help fight off acne or other skin related conditions. No food means no toxins, so fasting lowers the damage by those toxins and detox your body. Also, no digestion means body can focus on healing or improving the skin. Fasting is also a part of various religions. Hinduism has a great place of fasting, observing a vast number of fasting days throughout the year. In fact, if you fast on each day the religion warrants/recommends a fast, you’d enjoy the benefits of fasting to the fullest. Even other religions including Christianity, Islam Buddhism, Judaism, Sikhism and others have one or another custom involving fasting.